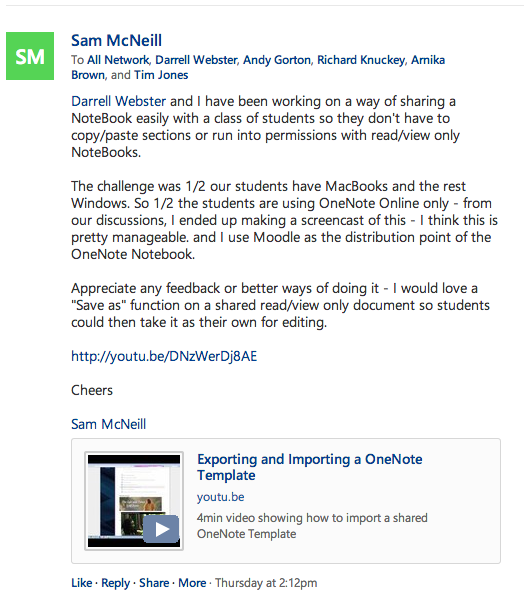 Collaborating With The World: From Twitter, to OneNote Online, to Lync, to Yammer! This is a story of collaboration. It’s also a success story – of starting with a problem causing frustration and then ending with a solution that was shared with a wider community for their benefit. Given that the New Zealand curriculum places a strong emphasis on participating and contributing, I thought I would share this story to show that teachers, and not just students, actively engage in collaboration. The basic task I was trying to accomplish was sharing a “template” OneNote Notebook with students who could take their own copy of the NoteBook and then edit it, either within the desktop version of OneNote (for students with Windows 7 or Windows 8 computers) or via OneNote Online (for students that had an Apple Mac). This shouldn’t have been too difficult, but given the reduced functionality in the browswer based version of OneNote, it was proving challenging. OneNote Online did a great job of helping Darrell and I understand what the real issues were, but then we wanted to extend this further to trying practical work around solutions. He sent me a Lync Online meeting request where his screen was shared and rather than just typing and sketching within OneNote, we were able to talk directly with each other as well. Over the course of 40minutes we established what the issues were and some potential work arounds. During this, Darrell recorded the Lync session and later published it privately on YouTube so that Ben and Marjoelein could review it later (by this stage, both had gone to bed because of time zone differences). Sharing a couple of screenshots of the Lync session does not do justice to the power of this tool. Keep in mind I was doing it all through a web browser on my MacBook Air – there was no desktop application involved. With a possible solution in place, I went away to do some more experimentation, and then created a screencast tutorial of what definitely worked. This was aimed at my students so they could carry out the task at the start of Term 3, but also helped solidify my understanding and meant I could share it with Darrell, Marjolei and Ben easily. In the end I got what I wanted – a relatively straight forward way to share a format-rich OneNote Notebook with a class of students so that they could edit their own individual copies. It’s not as straight forward as it probably should be, but there is simply no way I would have achieved this outcome without the significant contributions from people all over the world. I also doubt whether we would have been able to collectively understand the details of the issue without the use of technology like OneNote Online and Lync. Sure, Twitter connected us and Yammer allowed me to share the successful outcome with others, but the bulk of the “heavy lifting” of this collaboration was all achieved through typing, drawing and eventually talking, over Lync and OneNote. A big part of teaching is encouraging students to be resourceful and to collaborate with a wide range of people to achieve a successful outcome. It’s important that as educators, we can model how this can look in “real life”. I am passionate about education and the role that technology can play to facilitate this and I think this example demonstrates how easily expertise from all over the world can be accessed to achieve a great solution for our students. This entry was posted in eLearning, Religious Education, Technology and tagged Apple, Collaboration, Connecting with the Community, Curriculum, Key Competencies, Lync, Microsoft Education, Microsoft OneNote, Moodle, Networking, Office365, Pedagogy, Sharing, Social Media, Technology, Training, Tutorial, Twitter, Windows, Yammer, YouTube by Sam McNeill. Bookmark the permalink. 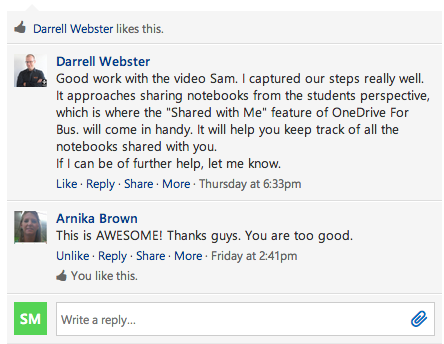 Why would you use Yammer, when Bitrix24 a lot more collaboration tools for educators and is essentially free? Bitrix24 only appears to be free for 12 or less employees – https://www.bitrix24.com/prices/ (or 15% off for non-profits) and besides, this Yammer group was set up by Microsoft NZ to allow staff across multiple schools to share ideas.